We’d love your help. 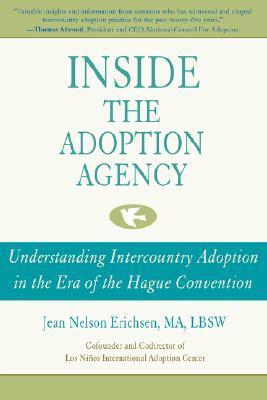 Let us know what’s wrong with this preview of Inside the Adoption Agency by Jean Nelson-Erichsen. To ask other readers questions about Inside the Adoption Agency, please sign up. Very good information. A little bit dated, but not much. The writing style was not as fluid as the lauding on the back cover would claim, but it was still a quick and fairly enjoyable read. Certainly would recommend to anyone thinking about intercountry adoption or anyone (like myself) who has a more professional/academic interest in the subject area.